The petition named ‘New war in Europe? Not in our name!’ was signed by 60 people from Germany’s politics, economy, culture and media sectors – among them former Chancellor Gerhard Schroeder and film director Wim Wenders. The group, led by former Chancellor advisor Horst Teltschik, former Defense Secretary Walter Stutzle and the former Vice President of the Bunderstag, Antje Vollmer, said that just because Russia and the West are experiencing differences at the moment, it “does not mean that the progress that we have achieved over the last 25 years with Russia should be terminated,” Telschik said. 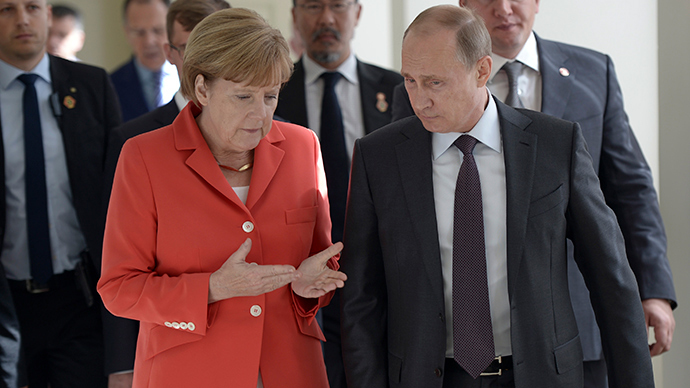 They want to see a new policy of détente implemented in Europe and urge the German government and the West to move away from a confrontational policy towards Moscow, in favor of one of diplomacy. While the security concerns of certain Eastern European nations are being heeded by the West, the group says that Russia’s grievances should also be heard. “The Russians’ security requirements are as legitimate and just as important as those of the Germans, the Poles, the Baltic States and Ukraine. We should not look to push Russia out of Europe,” a letter from the group said. They believe that the West should not be so focused on Vladimir Putin as leaders come and go, but should make sure the West does not ruin relations with Russia for generations to come. Historically, the group says, Russia has been a respected European power since the Congress of Vienna in 1814, while trying to confront Moscow has not been advisable. All attempts to forcefully change this status have failed “bloodily“.